AD plants are heavily subsidised by the Government and many supermarkets are marketing their supposed green credentials in sending surplus food to anaerobic digesters – however, should supermarkets be encouraged to help alleviate food poverty instead? “Frank Field, the former Labour welfare minister who is leading an inquiry into food poverty, called on the government and supermarkets to work together to emulate the success of France and Spain in ensuring that surplus food went to poor families. 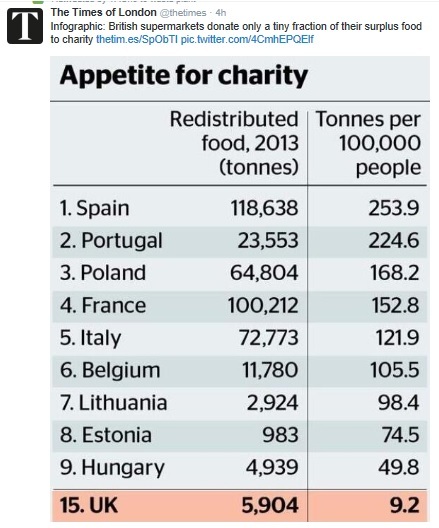 He said that other European countries had made the donation of food a cheap option for the industry by using EU money to subsidise the cost of redistributing the surplus to charity. The former minister said that Britain had declined to follow suit, choosing instead to subsidise anaerobic digestion plants, which turned edible food into green energy. The decision means that it is often cheaper for supermarkets to send surplus food to create power than to send it to charities to feed families. Mr Field said: “The big companies should be driving down waste…but in any system there will be some waste. We need to make best use of that waste through the subsidy system.